A favorite among consumers, the Panasonic SD-YD250 provides several customizable options for bread-making, including different loaf sizes and shades. While it gives you a lot of choices, the design still makes it simple to program what you want and let it do its work. A particularly nice feature is the dispenser that automatically adds the yeast at the appropriate time. A tall, silver breadmaker with a viewing window and helpful handles for easy lifting, the Cuisinart CBK-100 includes baking options for gluten-free loaves, jam, pasta dough, and cake. An optional feature we particularly liked was a beeping signal to remove the paddles, which prevents the loaf from getting that hole at the bottom when it’s removed. At just under $100, it’s a valuable purchase. One of the nicest things about the Zojirushi Home Bakery Supreme is that it produces long horizontal loaves like the kind made in traditional bread pans. The black and stainless steel exterior gives this breadmaker a modern feel, something you won’t mind leaving on the countertop. Special features include a delay start and a keep warm option, so the loaf will be ready whenever you are. Simplicity is key with the Hamilton Beach 29881. With a clean white, rounded exterior and a minimal amount of buttons, it’s designed to make bread-making as easy as possible. Despite this, the breadmaker handles a variety of recipes, from pizza dough to sweet bread to cake. If you’re looking for your basic breadmaker that functions well and produces consistent results, then this one is ideal. A high-quality breadmaker that’s also quite affordable, the Sunbeam 5891 has a large viewing window so you can monitor the bread’s progress. We appreciated the beeps to let us know when each cycle was finished in case we needed to add more water or flour. Also, the narrow build of the Sunbeam 5891 means it doesn’t take up too much counter space. Not everyone needs a humongous bread machine—for small households or those with small kitchens, the Zojirushi BB-HAC10, not much larger than a toaster, may be a preferable choice. Built for reliability and durability, this compact machine produces fresh loaves in three different textures: regular, soft, or firm. We were pleased with the accessories, including an instructional video and manual and a handy recipe book. A reliable machine and offering a great value, the Breadman TR2500BC comes in a durable stainless steel and has convenient handles for transporting. Particularly useful for gluten-free recipes, it also handles cake, bagel, and pizza dough. We were pleased with the rise and the fluffy texture of the bread and found the clean-up quite easy. The West Bend 41300 produces tall, horizontal loaves in four sizes. At $83.94, it’s affordably priced, and it has consistently satisfactory results. The controls are easy to figure out, and with a delay start option, you can program the bread to rise overnight and be ready by breakfast. A feature we especially appreciated was the “Home Made” setting that lets you customize the cycle to your preferences. Easy to use and ideal for the budget-conscious family, the Oster CKSTBRTW20 handles a variety of breads, including gluten-free, jam, and dough. The machine has a simple, clean design with a circular viewing window and clearly labeled controls. 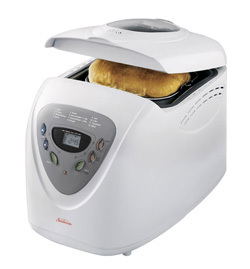 For an affordable, no-frills bread machine, this Oster model still offers several options, such as the Expressbake setting that readies a loaf in less than an hour. So you’ve decided you want to experience the joys of making homemade bread and smelling it bake in your kitchen—now you need to select a bread machine. 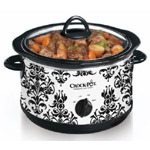 It’s nice to know that there is a wide selection of quality models ranging from only $50 up to $300 or more. Do you want the ability to experiment with various types of bread, such as whole wheat, multigrain, gluten-free, sweet, baguette, French, Italian, or banana bread? 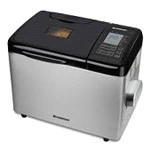 Are you interested in using a breadmaker to bake cakes or prepare dough for pizza and pasta? Would you like a machine that also makes non-bread items like meatloaf and jam? Most bread machine models today come pre-programmed with baking modes or settings that allow you to make a wide variety of breads. You just need to follow the recipe and instructions for mixing the flour, yeast, and other ingredients to get mouthwatering results. Bread machines don’t differ wildly in style, but you may find that you prefer one with a large viewing window and a bright LCD display that highlights your programming selections. Even if a bread machine doesn’t possess a window, that shouldn’t disqualify it. Some people argue that a bread machine offers more even heating and crispier crusts without one. How large is the family you’re baking for? If you’re single or one of a couple, you can get by with a small model that makes a 1-pound loaf, which yields about 8 slices. For a larger family, you’ll probably want a model that makes loaves up to 1.5, 2, or 2.5 pounds. A 2.5-pound loaf provides roughly 20 slices—more than enough to satisfy a family for several days. Whether a loaf comes out horizontal or vertical doesn’t affect the taste, but you may have a preference for one or the other. A tall slice from a vertical loaf may be more difficult to fit in the toaster. You also need to think of size in terms of the machine’s footprint. If you’re going with a big bread machine, will you be content to let it take up a lot of counter space, or will you okay with lugging it out of a pantry for each use? Smaller models make smaller loaves, but they’re also easily portable and don’t take up much more space than a toaster. The kneading and baking a bread machine performs is a very involved process, but you probably don’t want a machine that rattles and dances across the counter. Check up on reviews to get an idea of how much noise it makes. As with any kitchen appliance, cleaning the bread machine is the least fun part. However, if the machine is equipped with nonstick, removable parts, the task becomes much easier. Some models have a detachable lid that gives you better access to the inside cavity. 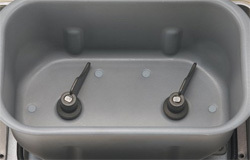 Note which models have dishwasher-safe parts and which require hand-washing. You’ll be hard-pressed to find a bread machine that doesn’t come with an instruction manual and recipes. If possible, browse through the manual before making a purchase to see how comprehensive the directions are. Do they walk you through each baking mode? Do they tell you how long each kneading cycle lasts? Do they offer clear recipes for a wide variety of breads, cakes, and jams? If the manual leaves something to be desired, there are plenty of bread making books available that are all-encompassing. Beth Hensperger’s “The Bread Lover’s Bread Machine Cookbook” is a widely popular choice, featuring over 300 step-by-step recipes.